Thursday June 17th 1926 I was busy in AM. Went down to Mrs Moores soon after dinner and Hattie down town. Later she went to call at Raymonds. Mr Raymond died late in the forenoon. I stayed at Mrs Moores till after supper. She came home with me. Rob out of town. 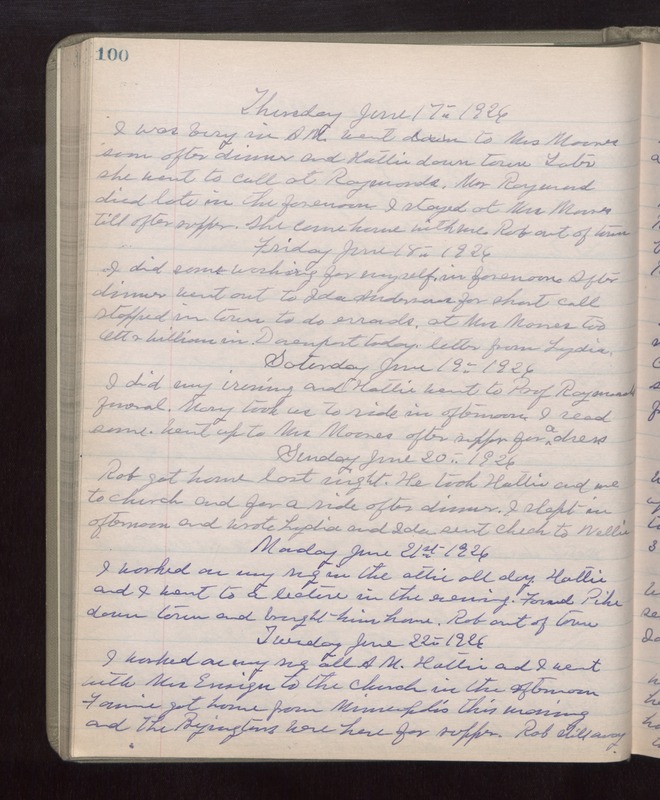 Friday June 18th 1926 I did some washing for myself in forenoon. After dinner went out to Ida Andersons for short call. Stopped in town to do errands, at Mrs Moores too. Ott & William in Davenport today. Letter from Lydia. Saturday June 19th 1926 I did my ironing and Hattie went to Prof Raymonds funeral. Mary took us to ride in afternoon. I read some. Went up to Mrs Moores after supper for a dress. Sunday June 20th 1926 Rob got home last night. He took Hattie and me to church and for a ride after dinner. I slept in afternoon and wrote Lydia and Ida, sent check to Nellie. Monday June 21st 1926 I worked on my rug in the attic all day. Hattie and I went to a lecture in the evening. Found Pike down town and brought him home. Rob out of town. Tuesday June 22nd 1926 I worked on my rug all AM. Hattie and I went with Mrs Ensign to the church in the afternoon. Fannie got home from Minneapolis this morning and The Byingtons were here for supper. Rob still away.